There’s nothing like the thrill of wandering alone through the isolated wilderness and coming upon wildlife in its natural habitat. Of course, that’s what happens when you’re raised next to a cow pasture in Kansas as a small child. 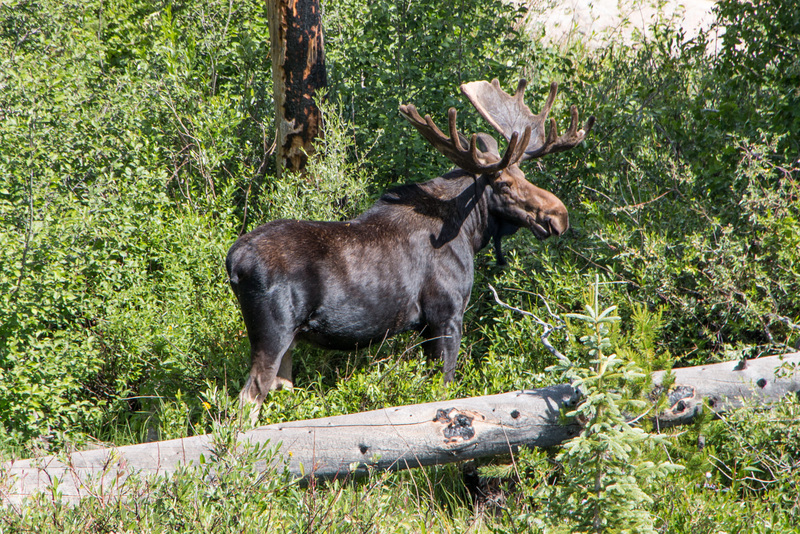 I immediately realized that I had come upon a moose, and not a small one at that. I stood for a moment completely lost in the thrill of being in the wild with such a massive animal. I unclipped my camera and began clicking. The wind died down for a moment, and the moose heard the shutter of my camera. 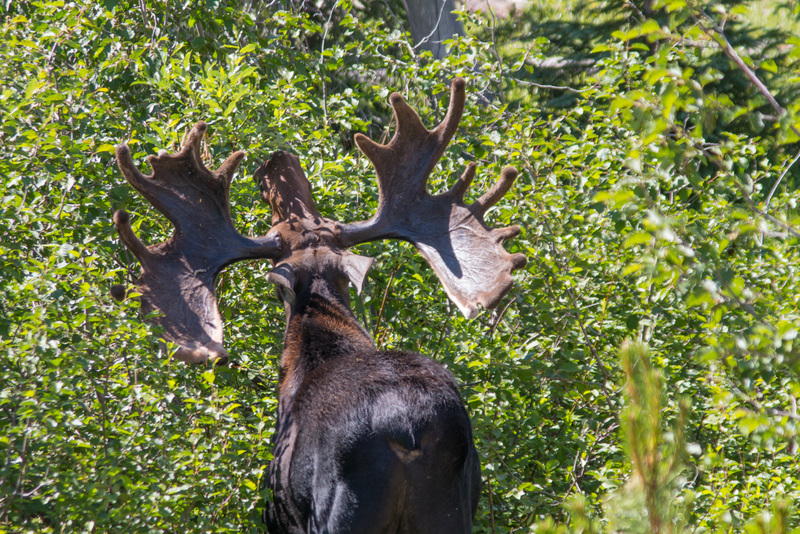 He raised his head and revealed his huge antlers, as he focused on trying to understand the sounds that he just heard. A second later, he spotted me. He let out a huge snort to let me know that I was in his world, and that he was much, much bigger than me. 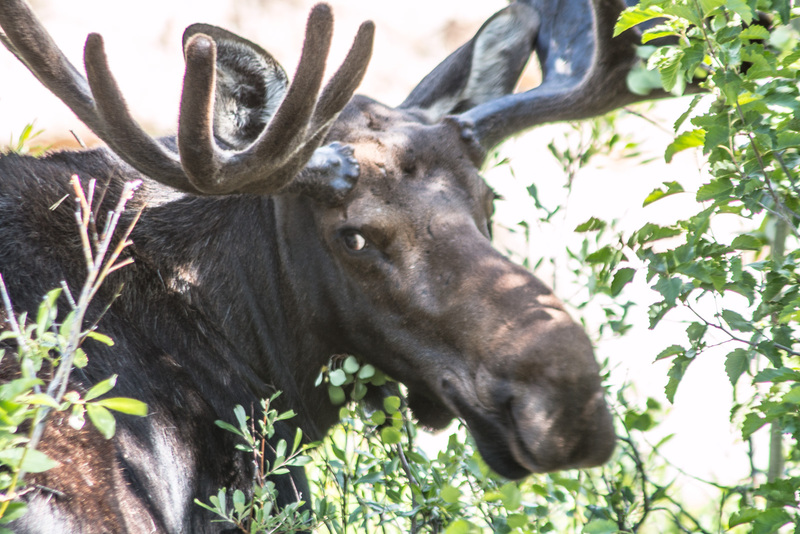 While moose are amazing animals to see, they are also ill-mannered, temperamental beasts, at times. 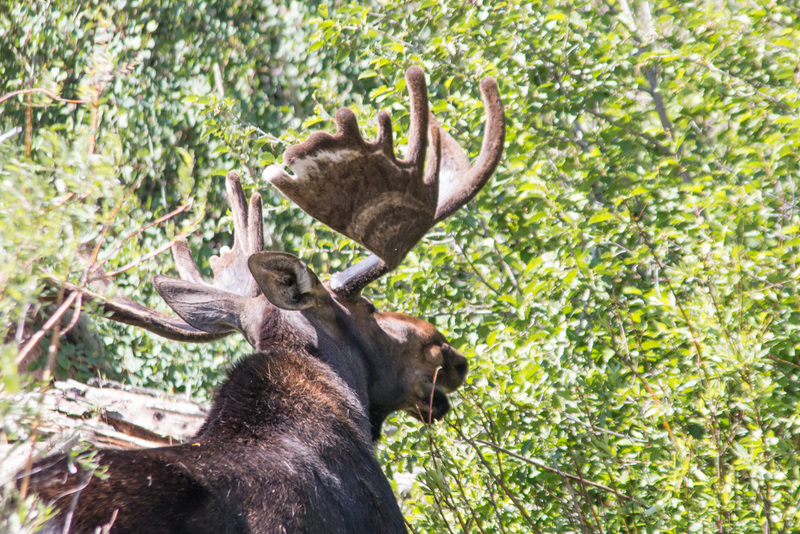 Only one animal in the world, the hippopotamus, inflicts more injuries on humans than moose. As an avid hiker and photographer, I knew that this was a rare, but potentially dangerous situation. We both stood for a few minutes looking at one another. I focused on breathing deeply and remaining calm. 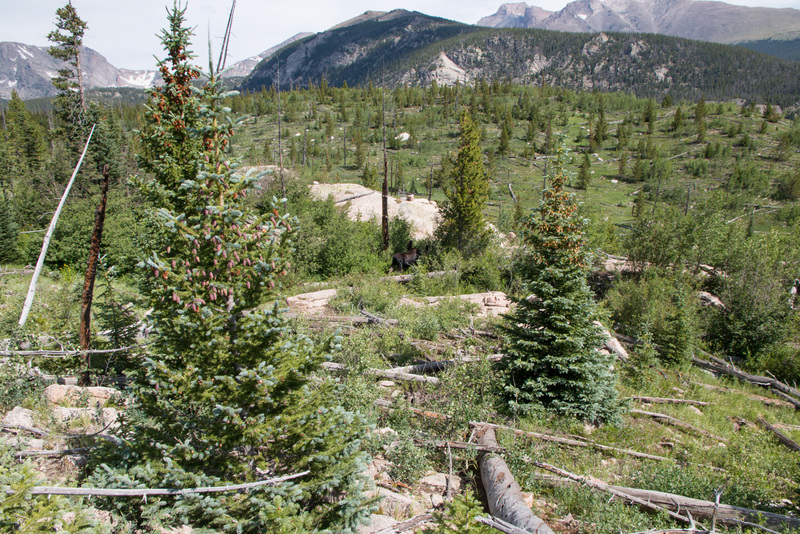 Panic, in any situation with wildlife, can create a situation that will likely end poorly. At this point, I knew that I was fairly safe on the top of a boulder, but I had no doubt that I would work to get closer to him to get some photographs of this majestic animal. We stared at each other for a few minutes, and once he decided that I was not a threat, he returned to eating the tender tree shoots. At this point, I was a good thirty yards away from him. I zoomed my camera out to capture the overall landscape in which I found him. 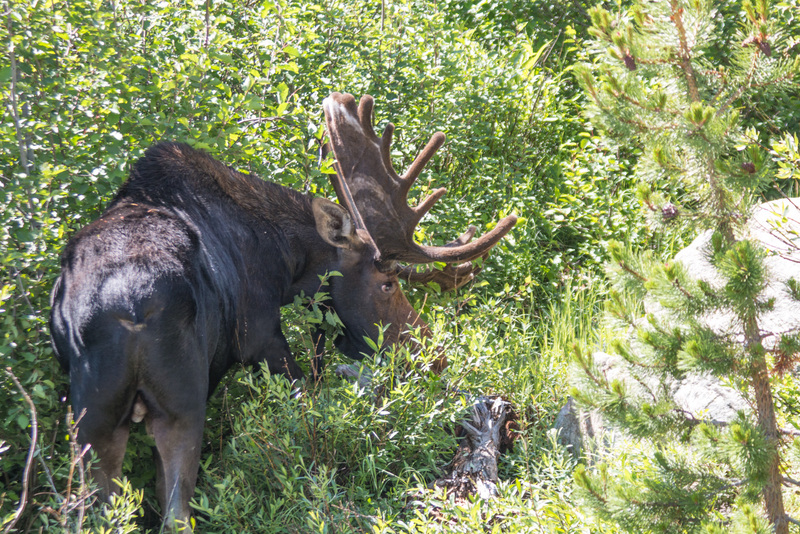 The boulder that is behind the moose was where I would eventually end up, which was no more than 30 feet from this amazing animal. I changed camera lens and slowly moved to another boulder that was a bit closer to him, taking a few more shots. 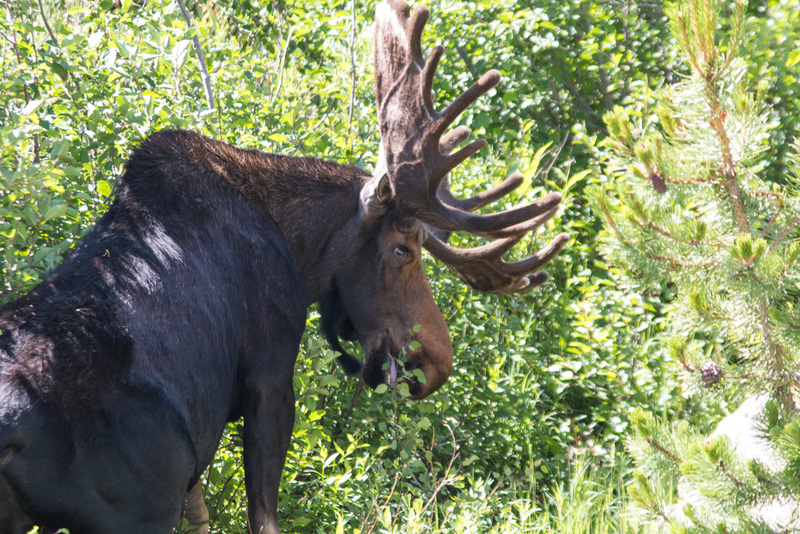 It was an amazing experience as I got closer and closer to this moose, as he happily munched away. Each time I moved, I moved very deliberately and carefully, always weary of his reaction. I knew that if I got on his bad side, I was in a somewhat risky position. 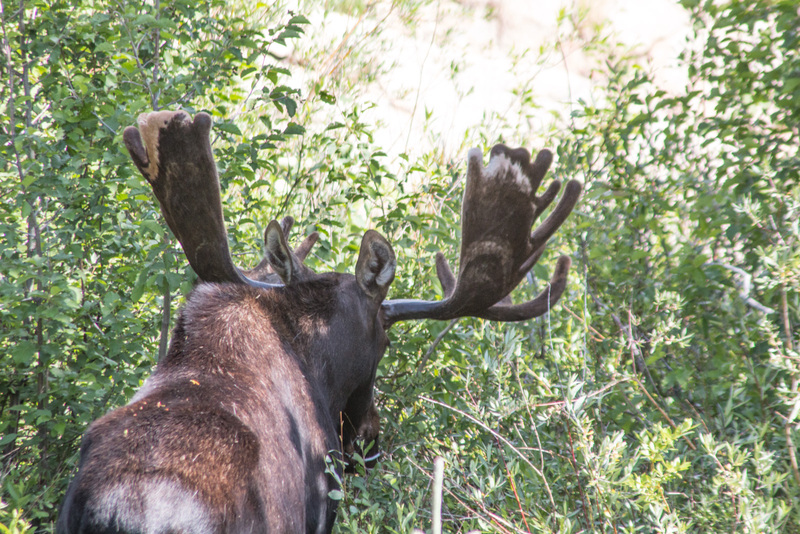 While from a distance, moose antlers look just brown, I was amazed at the patterns of color in his rack. 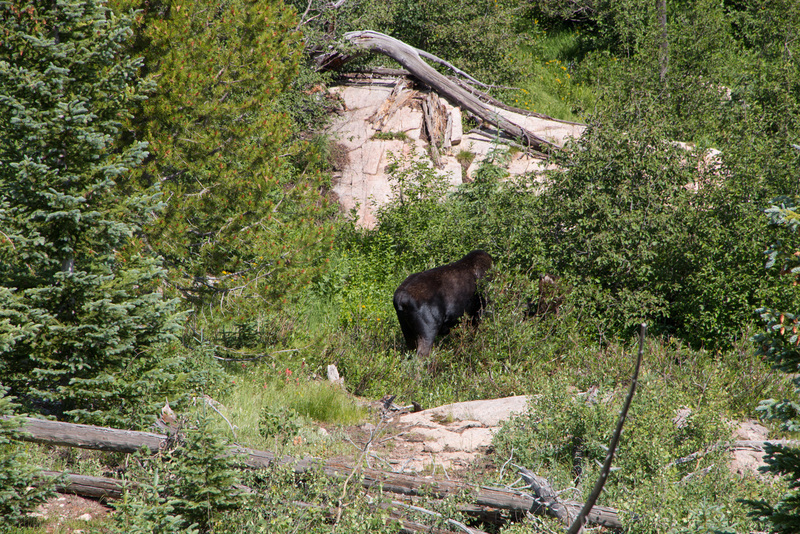 Over the next forty-five minutes, I slowly moved around this giant creature in a wide swath, as he continued to focus on eating. I was fortunate to be in a place that offered tall boulders and many fallen trees to move about upon, at least for part of the movement that I need to take. Eventually, I made a wide circle and was able to climb onto a massive boulder close to where he was eating. Ever weary, I mapped out my escape to even higher boulders, should he decide to move up the one path that he could have reached my location. 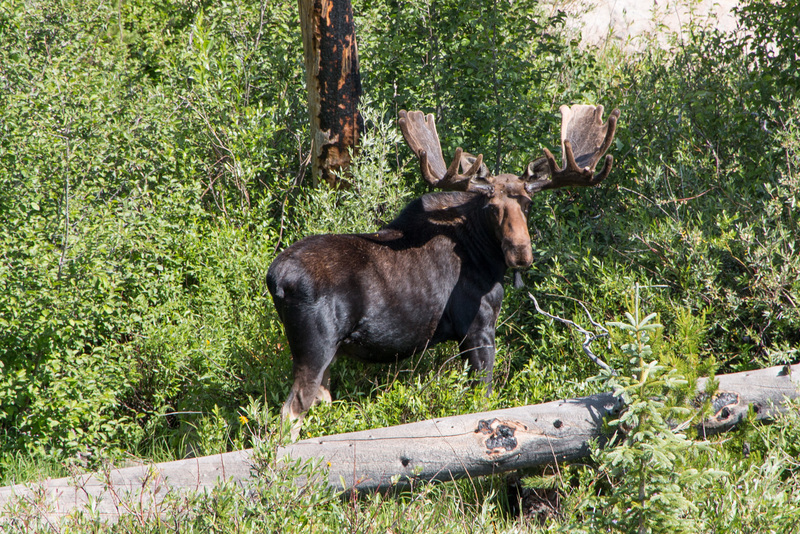 I was amazed at my good fortune in both having a relatively safe, but close location to observe this moose, and at being able to capture so many good photographs, especially considering that he was in dense foliage and bathed in shadows. It wasn’t until I got back to my computer that I realized that I was even able to catch a picture of his tongue and teeth as he munched on an aspen shoot! I was even lucky enough to have him stretch his neck upward, while I was directly behind him. The size of his rack was massive. I was impressed, but probably not as impressed as the lady moose in the area. Slightly more than an hour and a half after I first spotted him, this bull moose decided that his belly was full, and that he was ready to relax, away from the limelight. He moved deeper into the trees into an area that I could barely see, and laid down. I thanked this noble creature for giving me such a wonderful opportunity to spend some quality time with him, and headed on my way. Please click on any of the pictures below to open a gallery of larger size photos of all the pictures in this post. Disclaimer: I am an avid and experienced hiker and photographer in the Rocky Mountains. 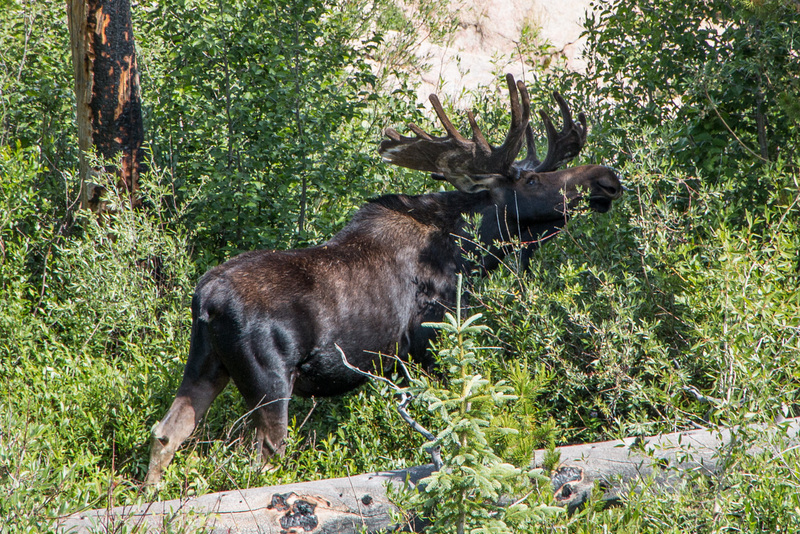 I do NOT recommend that you seek to get close to any moose that you encounter in the wild. 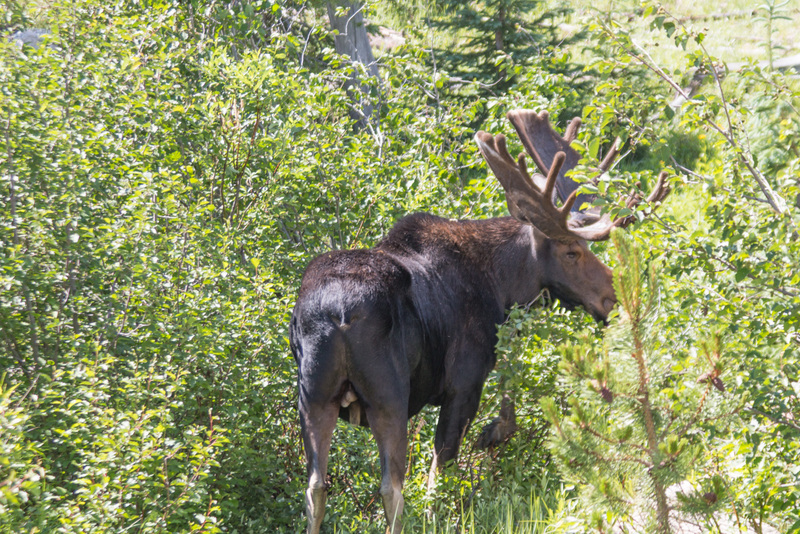 I highly recommend that you move away from any moose that you encounter in the wild. They are truly huge creatures that can be extremely dangerous. Impressive, for sure. I like your wise disclaimer at the end, too! Thanks! It was a fun day, but he did snort at me a few times, and it was a big reminder of who was the bigger creature. I love this post! Absolutely INCREDIBLE photos!